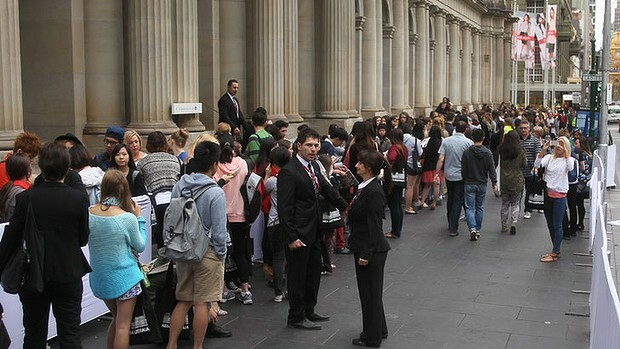 Over in Melbourne, there is still a long line up to get into H&M, and it has been open since April.. and we thought the line up for Krispy Kreme in Adelaide was embarrassing, it's almost completely gone, and will vanish once the next stores open. And yet there's a perfectly good Uniqlo around the corner. IT’S already been dubbed The Nightmare on Hunter Street – a looming choke of cars and traffic brought on by the opening of the new law courts and university campus in Newcastle’s CBD. When opened, the university’s New Space campus will house more than 2300 people at peak times. Its own transport study predicts, at best, that only 40per cent of those people will arrive by public transport. Despite that, the university has proposed only five on-site parking spaces. Next door at the new law courts, only 24 on-site parking spots are being built. Some rings true, but 95% of it happens everywhere across the globe. DEFENCE contracts. Mining projects. Driverless cars. More start-ups. Every Tom, Joe and Tony will tell you they have a solid plan to get this state moving forward (and nearly 70,000 jobless South Australians will be hoping one of them is right). Here are a few more directions I think SA needs to move in. Of all the problems facing this state, surely one of the most chronic and embarrassing is the apparent inability of South Australians to ride public transport properly. We don’t know how to move to the back of the bus. New passengers get on. You shuffle down a bit. It’s not hard. I’ve got four words for you, SA. Keep. Left. Unless. Overtaking. Oh, and those big noisy buses with the flashing lights? They’re called ambulances. When you see one, the correct response is not to screw up your face and look like you just woke up from a coma and found yourself in the driver’s seat of a Nissan Pulsar. Just get out of the way quickly, OK? Adelaide may be the fifth most liveable city in the world but we’re dead last on the OECD’s list of Socially Aware Nations. One of the more irritating ways we express this is our inability to stand to one side when having a family meeting or social reunion. Contrary to tradition here, the dead centre of a busy footpath is NOT the most appropriate place to get an update on Uncle Joe’s heart surgery or work out where to go for dinner, and certainly not with a double pram. So move aside. Adelaide is the only population centre on the planet where the pedestrians are happy to wait for the little red man to go green before attempting to cross, even when there are no cars coming. In other parts of the world, people actually live in their cities. Yeah, I know – crazy, right? Would it kill you to buy a little bungalow or rent an apartment within 35km of the CBD? Oh right, it would actually kill you. The two jobs, the giving blood to help meet mortgage repayments and all that. OK, forget I mentioned it. The city council had its way with Rundle Mall. Now it’s time to move the mall’s balls back to their symmetrical centre, just like Bert intended and in honour of his original vision. We should also rip up the Frome St bikeway. It won’t do anything for SA’s economy but it will make Peter Goers happy. Can we just turn our clocks forward to EST and move on to something more important? If we can’t the only thing moving will be all the people – to a state that’s really “On The Move”. Victoria. What do you think? Have your say below or Tweet with Greg @GregBarila. The bit about Adelaide pedestrians waiting for the green man is not true. Indeed, useless article. Everyone knows that the real problems are Adelaideans inability to stand to one side on an escalator so people can actually move past, and their refusal to let people get off the tram before attempting to board (and actually act surprised every time, like they've never seen anyone get off a tram before). What a wonderful idea, let's encourage people to cross during the red man. Who cares about road safety! On a serious note, plenty of people jaywalk in the city (myself included). It's probably more common in other cities, as our roads are far wider and can be more dangerous to cross. If there is three things that totally annoys me about living in Adelaide would have to be escalators, slow walkers and impatient people at tram stops (as Nathan pointed out). There is nothing worse trying to depart or leave Station Arcade, and people are scatted all along the escalators on either side... move people or stand to the left side!. crawf wrote: If there is three things that totally annoys me about living in Adelaide would have to be escalators, slow walkers and impatient people at tram stops (as Nathan pointed out). There is nothing worse trying to depart or leave Station Arcade, and people are scatted all along the escalators on either side... move people or stand to the left side!. But is it stand to the left or stand to the right? Seems it depends on where you were brought up and has nothing to do with the local side of the road your drive on or country you're in. In the London Tube, it's right. In Japan it's left or right depending on what city you're in. I've always walked on the left and stood on the right if lazy. But I think I got that behaviour from a visit to London. At Adelaide Station it's keep left unless walking on the escalator. Escalator etiquette is a an Australian problem and not an Adelaide problem, At least in my experience anyway. Apparently the site of the former Regent Cinema in Sydney was vacant between 1990 and 2006, a whole 16 years! Being at 487-503 George Street, it's right in the CBD as well. Optus Stadium designers considered incorporating a “roof climb” similar to the popular Adelaide Oval attraction but shelved it because they struggled to make it accessible for people with disabilities or restricted mobility. The revelation has sparked debate over whether some attractions should cater only for able-bodied participants or be banned if not everybody can use it. An Optus Stadium spokeswoman confirmed that a “roof climb and rooftop walk” were among ideas discussed when three shortlisted respondents were invited to submit ideas on how to use the precinct on non-event days. “This idea did not proceed to a firm proposal as preliminary advice indicated it would be a difficult option to establish if the stadium was to maintain its commitment to ensuring the stadium catered for everyone, regardless of age, experience or ability,” she said. “While the design of Optus Stadium does not currently include a fully accessible roof walk, the roof structure does contain a series of gantries, walkways and access points for maintenance purposes, which could be adapted into a rooftop walk in the future. The Adelaide Oval RoofClimb, which costs between $99 for a day tour and $225 to watch a quarter of an AFL game 50m above the turf, opened in 2016 and is promoted by the South Australian Government. It is not available to people with difficulty climbing unassisted. Tourism Council executive director Evan Hall said Perth was crying out for new attractions and urged the Government to reconsider an Optus Stadium climb. “Some attractions, by their very nature, are not suitable for everyone but this doesn’t mean they should be prevented from going ahead,” he said. Premier Mark McGowan said wherever possible attractions should have universal access. “That’s the way that a civilised community should conduct itself,” he said. I should disclose that I am not disabled myself... but really, I don't think a development opportunity like a roof climb that should not be blocked simply because a portion of the population isn't able to access it. Given there are people that are excluded due to cost i dont see an issue. I know, it makes ours seem like pocket money.